A lava stream plunged into a tube system below the top layer of crust Thursday at the site of the Thanksgiving Eve breakout vent at the Kahaualea Natural Reserve on the Big Island. The public will be banned from the current site of the Kilauea eruption on state land next to Hawaii Volcanoes National Park until July 25, 2009, under a decision by the state Board of Land and Natural Resources. The board voted yesterday to keep the Kahaualea Natural Area Reserve closed because of safety concerns over flowing lava and toxic fumes generated by the eruption. 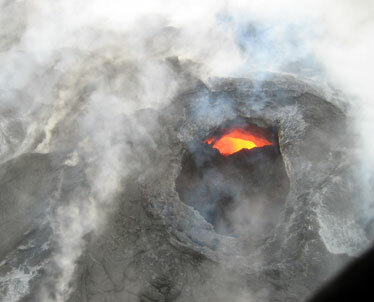 The eruption spread into the 16,726-acre state reserve after a new vent opened on July 21. The state closed the area on July 25. Yesterday's board action ratifies and extends the closure. At this time, "there is no clear trend to suggest that the magma supply is decreasing significantly," said Steve Brantley, deputy scientist-in-charge of the Hawaiian Volcanic Observatory. Another Thanksgiving Eve breakout vent opened on Nov. 21. The two vents -- fissure D and TEB -- are more than 100 feet apart. The lava flows erupting near the vents are full of gas and form pahoehoe flows that are treacherous to walk on and can lead to deep cuts on the legs and arms or broken ankles if one falls, Brantley said. Because there are two active vents, it is difficult to predict the direction of the lava flow from one day to the next, Brantley added. "It makes the unknowing visitor more susceptible to surprises," he said. The Hawaii Fire Department has responded to five rescues at the reserve since it was closed in July. One of the five rescues occurred just three days ago, said Lisa Hadway, natural area reserve manager for the Division of Forestry and Wildlife. Officials also said downwind exposure from sulfur dioxide fumes can be hazardous, especially for those with breathing problems. Signs about the closure were posted at entry points in July. Information on the signs will be modified to reflect the board's decision yesterday. Violators face a misdemeanor offense with penalties of up to $1,000. Also, penalties can be pursued through administrative means, in which case violators could face a fine of up to $2,500 for the first violation and more for subsequent violations, Hadway said.